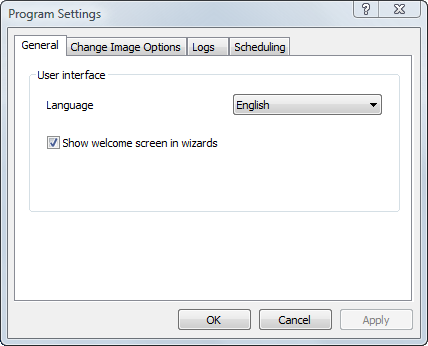 You can change the program settings in the Program Settings dialog. From the File menu, choose Settings. . .
To preserve the changes you made, click OK or the Apply button of the dialog. When Active@ Disk Image is running under Windows PE (from a Boot Disk), setting changes are not retained as they are stored in the System Registry which is discarded after reboot.